The weather is finally heating up, which means we’ll be spending even more time outdoors. Since we’re always on the go, it’s imperative that I have snacks for the family on hand. These boys are always hungry. I like shopping at Publix because it’s convenient, clean and always has great sales, like their weekly BOGO deals. So, when I found this exclusive coupon to save on my family’s favorite snacks, I had to make a run for the store. What are your favorite snacks for on the go? Do you always make sure you have them on hand? Nate and I like to snack on General Mills Fiber One Chewy Bars or Chex Mix Snack Mix, while the boys favor Frito-Lays Sunchips, Fritos or Doritos. 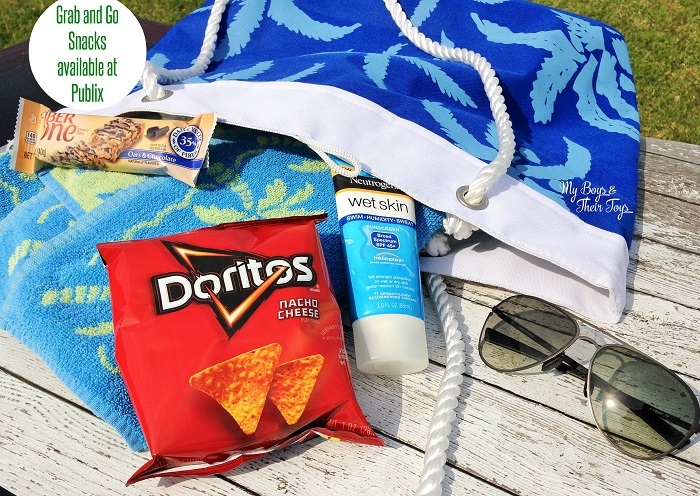 All of these snack foods are great for on the go and easy for impromptu visits to the park, beach or pool. The Fiber One Chewy Bars are seriously good, especially the chocolate versions. Plus one bar offers 35% of your daily fiber intake. The Frito-Lays ready to go snack bags are located in Publix’s chip aisle and offer a convenient way to store multiple bags for on the go. Of course on hot days we like to cool down with an ice cream treat, like Klondike ice cream sandwiches. So what are you waiting for? Grab your $5 savings at Publix. Just click the picture below to add the digital coupon to your Publix savings. Enter our giveaway for the chance to win $15 Paypal Cash & grab your favorite snacks on us! Klondike Bars are my favorite! So delicious! I love their yogurt…eat it everyday. I also like the Ben & Jerry’s ice cream. I snack often on the Chex Mix, too. I really love cheetos…especially the jalapeno flavor! I love Chex Mix. The spicy is my favorite but I like the muddy buddies too. I like nacho cheese doritos & diet pepsi for a snack. Lays chips are our favorite. I like Quaker Real Medleys Bars . I love Yoplait Greek 100 and Greek 100 Whips. They are great for the sweets cravings! My hubby and sons would say Ben and jerrys! My favorite snack from the participating sponsors is Frito-Lay Sun Chips. My favorite snack from those sponsors are the klondike bars!! Oh I love the Chex Gluten Free Granola Cereal! I like Chex Mix. Thank you for the giveaway! My favorite would be Ben & Jerry’s cups! What else? I love Doritos, any flavor! Cheetos cheese flavored snacks is my favorite. I could go for some right now. Wish I had some here. My favorite snack is chex mix.. definitely chex mix.. I could really go for some chex mix right now! My favorite snack from General Mills are their Nature Valley Granola bars. I like Quaker Real Medleys Bars. My favorite snack is Fritos , especially with Frito Lay Bean Dip. I love the Klondike bars! My favorite are the Yoplait Greek 100 and Greek 100 Whips. Chex mix is my favorite snack, for sure! I really like fiber one brownies! I love the Fiber One Bars! They are great for on the go snacks! My wife and I like the Chex Mix. My favorite snack is Klondike Bars! I didn’t realize cheetos were general mills. CHEETOS!! Om nom nom! Oh I also really love the Yoplait Greek 100 and Greek 100 Whips!!! Love the calories too! Cheetos or chex mix, depending on my mood. I love the creamy Klondike bars. What’s wrong with Cheetos? Wh won’t you recognize my entry? Fritos chips have always been my favorite! I love the Klondike bars;) They are so creamy and delicious! We also really love the Klondike Bars !!! My grandsons favorites in the summer!!! My favorite is the Yoplait Greek 100 yogurts. I like to add the Yoplait Greek yogurt in my smoothies. I really love the Lipton Iced Tea!!! Perfect for summer! Just noticed Ben and Jerry’s is on the list. ICE CREAM! Not that ice cream is exactly considered a snack.. but who cares?! YUM! Chex mix all the way! It’s something quick and easy for the kids when they need a snack. I love the Chex Muddy Buddies, but it’s so hard to find them here! Oh we also really love the Cheetos Cheese Flavored Snacks! I love Doritos and Mountain Dew. I love Lays potato chips and a cold Pepsi. Ben & Jerry’s Cups–so many flavors and just the right size for a snack! My favorite snack is Original Chex Mix. Yum! Thank You for the giveaway…our kids love Cheetos Cheese Flavored Snacks ! Doritos is a favorite of mine…and the whole family!!! 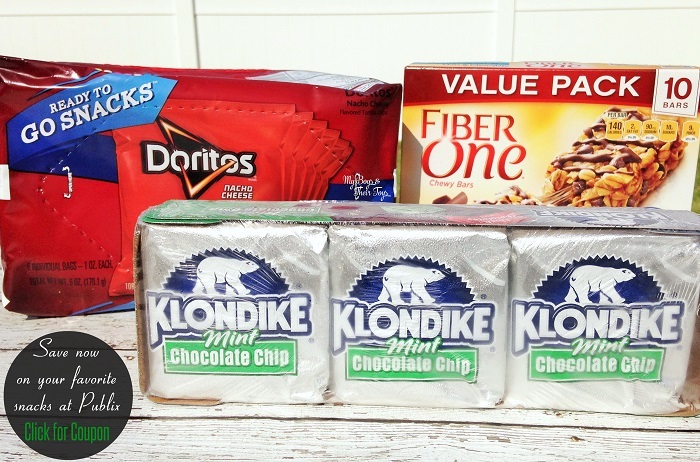 My favorites are Klondike bars and Yoplait Greek 100 yogurts! Sun Chips and Diet Pepsi would be my personal favorites.